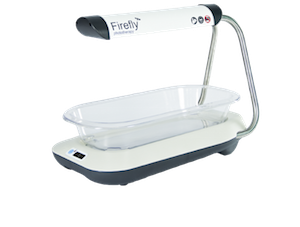 Firefly is a device designed to treat infant jaundice in a hospital setting, designed specifically for low resource settings to reduce the cost of phototherapy treatment. The devices (including a LED blue light source and basinet) are designed to operate continuously 24 hours a day for 5 years, with an estimated treatment cost per infant of $1.50. The Firefly was created by Design that Matters in conjunction with the East Meets West Foundation's Breath of Life initiative and Vietnamese manufacturer Medical Technology Transfer and Services (MTTS).